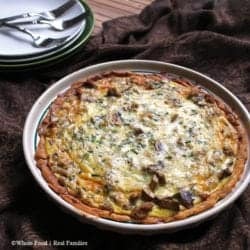 Sausage Mushroom Quiche with Chives is warm, savory and sure to please everyone at your table. Including the cook because it comes together easily for an easy weeknight meal. A couple of nights ago, as I stared into our post-vacation refrigerator, I knew it was going to be a Sausage Mushroom Quiche sort of night. Simple, made from kitchen staples and delicious. And after a week of fun and frolic with our 3 kids at the beach, I was looking for something everyone would eat that didn’t require a grocery store trip for me. But I was having a little trouble with the chopping and cooking because my hand was sore. The day before, I had a run-in with a splinter… which sounds insignificant, except the splinter was large and went all the way through my finger and came out the other side before breaking off. It required an Urgent Care visit to remove. It wasn’t life altering – but it also wasn’t my favorite way to spend the first day back from vacation. After asking my teenage daughter for help with dinner, I realized that she had no idea how to make quiche – blogger mom fail. How did that happen? Quiche is so easy. And such a useful recipe to have in your back pocket! I make quiche when I need a break from cooking. Or when I have leftovers that I need to use or small bits of veggies that need a home other than the trashcan. You know the bits left on the ham bone after Easter or Christmas? I pick them off and make quiche. You can make quiche from pretty much anything as long as you keep the proportions right. Have a look at this Basic Quiche Recipe for an outline of proportions and what has to be cooked ahead versus what you can just toss in with the eggs. Needless to say we remedied my parenting oversight. The photos you see are of my 15 year old daughter’s first quiche. I think she did pretty well. What do you think? Leave her a comment below and make her day! In a large skillet over medium heat, brown the sausage. Add mushrooms and cook until all the water has released from the mushrooms, 6-8 minutes. Drain any grease from the pan. Add drained mixture to the pre-cooked pie crust. So impressive! Hard to believe this was the first! Good job. It is fun to see them learn to be confident in the kitchen! It gives me hope for her eventual independence!